Richard Lindon & Co. Rugby England. 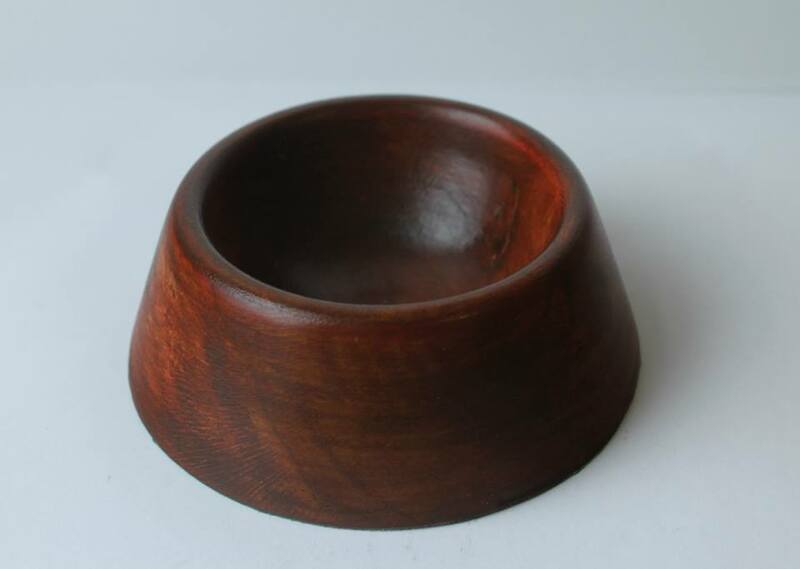 Richard Lindon & Co. are the privileged holders of the Registered Design for the Original Punt-about ButtonBall. A beautiful antique / vintage rugby ball. Circa 1854 : Rugby School, England: Kicked high in the air, dropping down a disused chimney and lost, preserved in soot, behind old wood panels for over one-and-a-half centuries. A hybrid 7-panel Punt-about ButtonBall, made before the split between the Rugby Football Union (Rugger) & Football Association (Soccer). 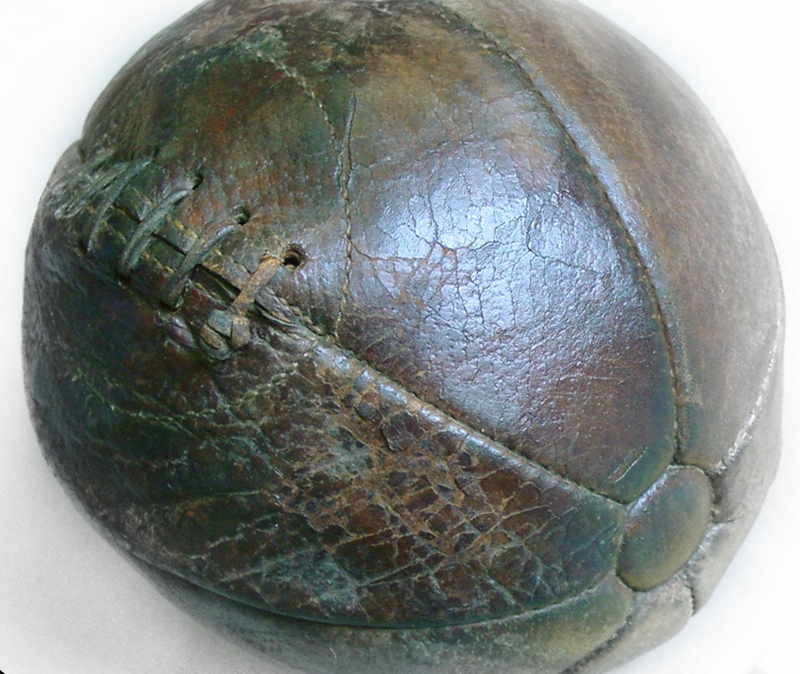 The Punt-about ButtonBall is the worlds oldest known "template" ball inflated with a India-rubber bladder (after pigs bladder) which revolutionised standardisation in ball manufacture and allowed the spread of the game throughout the world. Resembling the plum shape of the earliest rugby balls, the "panel & button" design also led to the creation the very first soccer balls. A truly beautiful treasure from the past. Tom wondered within himself, as they strolled back again towards the fives' court, whether the matches were really such break-neck affairs as East represented, and whether, if they were, he should ever get to like them and play-up well. He hadn't long to wonder however, for the next minute East cried out, "Hurra! here's the punt-about,- come along and try your hand at a kick." The punt-about is the practice-ball, which is just brought out and kicked about anyhow from one boy to another before callings-over and dinner, and at other odd times. Extract from "Tom Browns Schooldays"
Son of John Lindon, Carpenter form Clifton-upon-Dunsmore, Nr. Rugby, and Mary Over, from Rugby. (Married 2nd July 1811). Richard Lindon's father died when Richard was young. 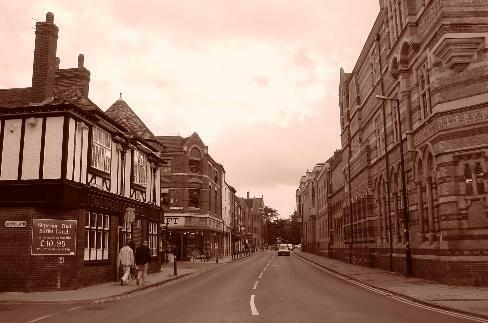 Richard and his mother, Mary, lived at her parents house, 20 High Street, Rugby which, is situated in the street immediately across from the front doors of Rugby School. In the 1841 Census Richards trade is already established as Shoemaker from this address. " 20 High Street was predominently populated by the Over family (His mothers family home.) With 10 Overs living their at that time plus Richard and his mother (Mary died on Oct. 6th 1848 age 58), John Webb ( a carpenter), Lawton Smith an apprentice and Sarah Smith the house servant. As a Boot & Shoemaker Richard Lindon prospered supplying footwear to the towns folk of Rugby plus of course the teachers and pupils resident opposite. Richard Lindon, naturally, had regular supplies of boot leather delivered and was consequently bombarded by the boys of Rugby School to manufacture footballs for them. All balls, soccer and rugby, in those days were not spherical they were more "Plum shaped". The reason being that a pigs bladder was inflated by mouth and the snapped stem of a clay pipe then encased in panels of stitched leather. As such the individual pigs bladder dictated the shape of each ball. Richard Lindon continued to trade from his Grandfathers establishment during the 1840’s. In 1843 Richard Lindon was married. 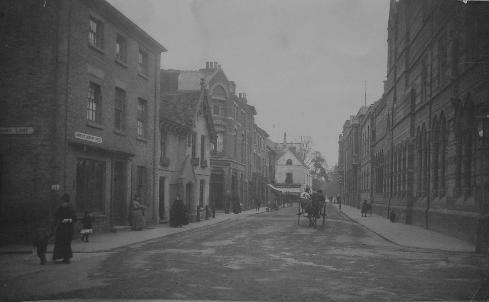 He moved to 34 High Street , which is located further down High Street, away from Rugby School. Mrs. Lindon (Rebecca b. 1830) drew the short straw as official "green" pigs bladder inflator, (plus mother to 17 children !! ), She also ran an Employment Agency for Servants. Blowing pigs bladders was not without its hazards. If the pig was diseased.... it was still going through Mrs. Lindons lungs. Alas Mrs. Lindon blew on one too many infected pigs bladders, over the years, contracted a lung disease fell ill and consequently died. Extract of the 1851 National Census showing Richard Lindon as Head of House, Rebecca, his wife, 4 children Hughes John Lindon being the current baby in the bunch and Ann Haymer their House Servant. The Lindon family address was 34 High Street at that time. By 1855 the entrepreneurial Lindon had also signed up as an agent for The Hope Mutual life assurance and Honesty and Guarantee Society. The Mid-1850's Richard Lindon sought a safer alternative to the fresh green pigs bladder and came up with the "India rubber" bladder. India Rubber, which Lindon saw used in many applications in 1851 at The Great Exhibition, Crystal Palace, London, was too tough to inflate by mouth and after seeing an ordinary glass ear syringe he produced a larger brass version to blow up his footballs, which he demonstrated, and won medals, at an exhibition in London. 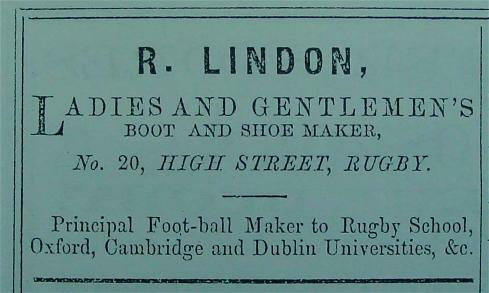 R. Lindon 1st Advertisement in the Rugby Almanack 1862 Edition. 1862. 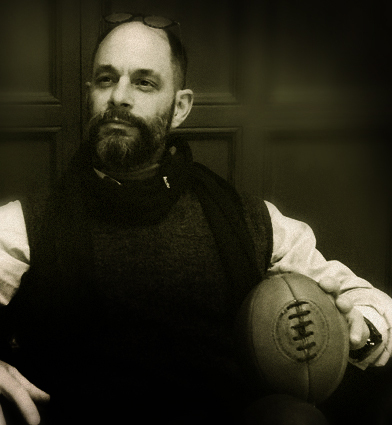 Courtesy of his "Inflatable Bladder" has become Principal Football Maker to Rugby School. In 1867 Richard Lindon became Proprietor and Freeholder to 6 Lawrence Sheriff Street, Rugby, immediately opposite the front doors, that lead into the Quadrangle, of the world famous Rugby School. This "on the doorstep" location coupled with his 1850's, rubber bladder and brass hand pump, eureka moment, continued to establish Lindon as the Principal maker of Big-Side Match Balls for Rugby School, Oxford, Cambridge and Dublin Universities etc. Alongside his little "Puntabout" 7-panel button balls, which were to be found in the school bag of every sporting student. His invention allowed the production of the first ever "round" ball for soccer, though it still had a button at each end of the ball to hold the stitching together at the point where the leather panels met. "Buttonless balls" became a prime selling point for suppliers and makers of both the rugby and soccer ball by the 1880's.The Rugby School boys still wanted an oval ball produced to distinguish their hand and foot game over the soccer football so Lindon created a bladder design which allowed a more exaggerated egg-shaped, four panel, buttonless ball to be manufactured. 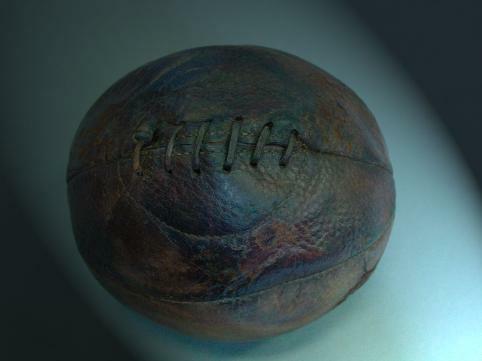 Thus the first specifically designed "Rugby" ball and the start of size standardisation. In 1877 (the year William Gilbert died) Richard Lindon "wrote his will" leaving his shop to the Godparents of his surviving children, Mr. William Over (a relative through his mothers family) and Mr. Samuel Welldon. Richard Lindon died on 10th June 1887 and was buried at the Holy Trinity Church in Rugby. Lindons son, Hughes John Lindon (b. April 24th 1850 - d. December 22nd 1909), worked in the business and purchased the proceeds of his fathers will, 6 Lawrence Sheriff Street plus stock fixtures and fittings, from Over & Welldon on 12th April 1888 for £1,000.00 in order to continue trading. 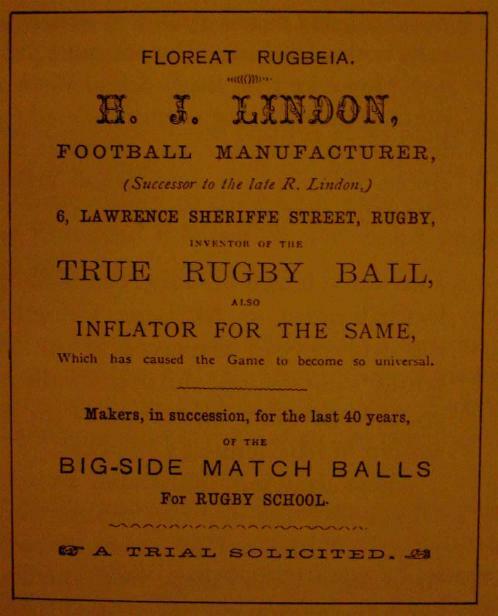 H. J. Lindon, FOOTBALL MANUFACTURER, "Successor to the late R.Lindon", 6 Lawrence Sheriffe Street, Rugby, Inventor of the TRUE RUGBY BALL, ALSO INFLATOR FOR THE SAME, Which has caused the Game to become so universal. The punctuation is accurate. The layout is misleading. For this reason HJ Lindon has been un-necessarily credited for his father's endeavours. In 1896 Albert Jiggle had a Boot and Shoemaking business at 12 Warwick Street, Rugby. His brother William set up the same, mainly repairs at 50 Wood Street, Rugby. In 1899-1900 Hughes John Lindon retired from Foot-ball and Shoemaking and rented 6 Lawrence Sheriff Street to Albert Jiggle who continued to trade until the mid to late 1920's. Hughes John Lindon retired to Yew Tree House, Brook Street, Walcote Leicestershire England. On 22nd December 1909 HJ Lindon died. The premises was left to his wife, Mary Ann Lindon (b.21st December 1876 - d. 6th May 1952), and after her death, on 6th May 1952, it was passed onto his daughter Miss Annie Rebecca Idena Lindon (b. 1909 - d. 1983) (Richard Lindons Grand daughter). Idena Lindon, as she was known, maintained possession of her Grandfathers Brass Pump and Medals. She eventually passed them onto The Rugby Football Museum in Rugby which, are still on display to this day for all to see. Idena married William Ralph Roots on 1st April 1953 at the Holy Trinity Church in Rugby. Idena Roots sold 6 Lawrence Sheriff Street on 26th January 1971. Although married she never had children. In 1983, nine months after her husband passed away quietly in his chair in Fishers Close Kilsby, Nr. Rugby, Idena lost concentration whilst driving her car along Kilsby Lane towards Rugby and was involved in a head-on collision being killed instantly. Her ashes were scattered over her parents Grave in the Churchyard at Misterton, Nr. Lutterworth, Leicestershire England. The Lindon Rugby Ball linage and it's relationship with 6 Lawrence Sheriff Street came to an end. It is likely that Richard Lindon was apprentice to William Gilbert's workshop as they were immediate neighbours when Richard Lindon was growing up. William Gilbert was 30 years old when Richard Lindon was a 13-year-old neighbour looking for an apprenticeship. In the 1841 Census, Lindon was 25 years old, living next door to William Gilbert, Richard Lindon's trade being Shoemaker. 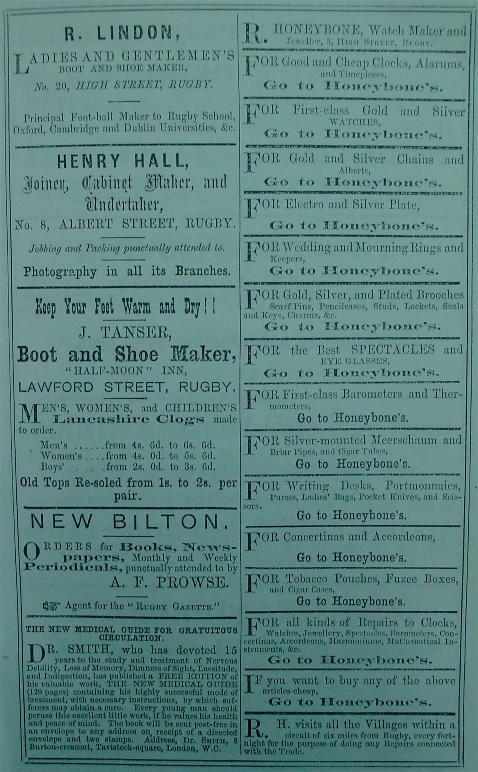 In contrast Richard Lindons neighbour, and possible former boss, William Gilbert (1799-1877), a fellow boot & shoemaker, who spent a lot on advertising and had good links with Lillywhite (see "The Ball" page) went from strength to strength. William employed his nephew James Gilbert (1831-1906) to assist him in the production of Rugby Balls and, in turn, James Gilbert's son James John Gilbert (1856-1917) carried on the family tradition which catapulted the "GILBERT" name well and truly into the annuls of Rugby History. Above the shop at 6 Lawrence Sheriff Street, Rugby. Richard Lindons Shop (No 6.) is the premises in the photograph with an awning extending over the pavement (far end of street scene). You'll note that the architecture of Rugby Schools building (along the right hand side) changes opposite the shop, it becomes more prominent. This is the existing entrance to "Tom Browns schooldays" Rugby School Quadrangle. Richard Lindons Shop. (Photo 31-10-2006). 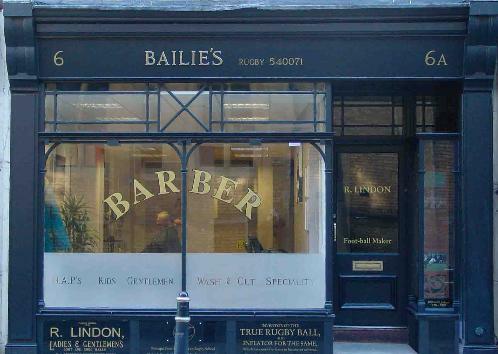 Today Richard Lindons Shop is a Barber Shop, designed by Simon Hawkesley CEO of Richard Lindon & Co., run by Mr. Michael Bailie "Bailie's" below the window sill the shop makes reference to the advertisements of it's historic owner. To the left of the entrance is a window display case dedicated to Richard Lindon. The door on the photograph leads upstairs (6a Lawrence Sheriff Street, Richard Lindons former home) and is today divided into 3 residential apartments, also designed by Simon Hawkesley. The Shop Front enjoyed "grant assistance" from English Heritage, Rugby Borough Council and The Rugby Town Partnership in 2006. 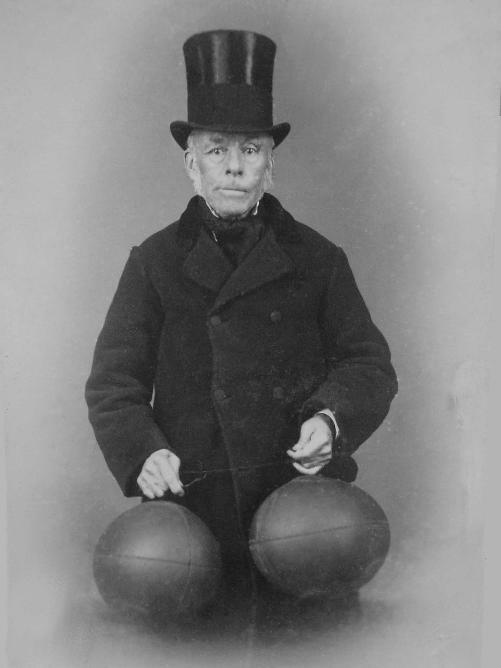 Richard Lindon (1880) displaying 4 panel Big-side Match "Buttonless Balls"
The first football, both rugby & soccer, was a pig's bladder, inflated with human lung power, and knotted at the end like a balloon. As it was susceptible to popping so Boot and shoemakers were introduced to manufacture a leather case for the ball, which, in those days, reflected the shape of the bladder. This was "plum or even pear shaped"; rounder than today's rugby ball, but certainly not spherical. As such both rugby & soccer, until the late 1850's, was still predominantly played with a "plum shaped" spherical ball but significantly with an inner-tube made of a pigs’ bladder. There was nothing in the early rules about the size of the ball to be used. Some of those used in the "village" puntabouts were enormous by today's standards. In 1842 William Gilbert moved his shop from High Street in Rugby which lead directly to Rugby Schools Quad Entrance and relocated in St. Matthews Street which was directly opposite Rugby Schools playing field, known as "The Close" for a strategic advantage. 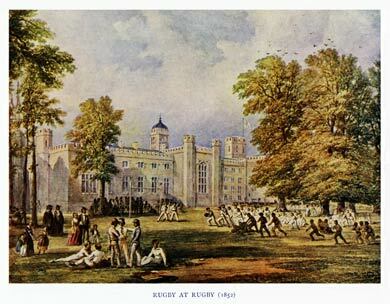 John Lillywhite was employed at Rugby School in 1850 as the schools first cricket professional and possibly assisted William Gilbert to launch his footballs and rugby balls to the London clubs of the 1860's. Lillywhite himself saw the financial potential of manufacturing footballs. His association with the ball makers of Rugby allowed him to capitalise on this opportunity. During the mid-1850's, following a visit to the 1851 Great Exhibition - Crystal Palace London, Richard Lindon introduced India rubber inner-tubes and a direct replacement for the previously used "pigs bladder" and because of the pliability of vulcanised rubber the shape for a soccer ball could finally be spherical. First attempts were made using 7-panels of leather with a leather "button" at each end which was reasonably spherical, only slightly egg-shaped, and proved a huge success with the boys of Rugby School as an affordable day-to-day Punt-about. 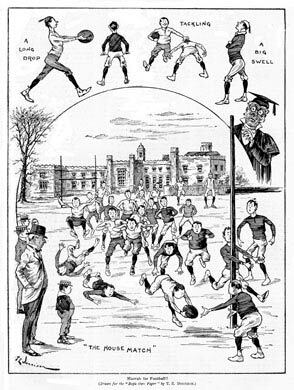 Likewise the "rugby ball", at Rugby Schools request, to distinguish their ball over other schools, gradually changed from a pigs bladder plum to an exaggerated egg with Lindon changing the shape of the rubber bladder to accommodate. This involvement singularly recognised and allowed Lindon to advertise as the "Principal" Maker of the Big-Side Match Balls to Rugby School, Oxford, Cambridge and Dublin University etc". Standardisation: For the first time in the history of the, inflatable, ball a template for leather panels could be made and balls be replicated time over to an exacting standard. Richard Lindon became the founding father to the first original round soccer ball and the original oval rugby ball. Lindons stitching technique improved and the rugby ball was reduced from 7-panels to four and without the need to gather the ends around a leather button. This design has not significantly changed since. The first time that a "standard" soccer ball was specified was for a representative game between the (London) Football Association and Sheffield Association in March 1866, when it was stated that "Lillywhite's No. 5" must be used. Later, the Harrow Chequers club proposed that a fixed size of ball should be used for the FA's Challenge Cup Competition. The general agreement was also that Lillywhite's number 5 should be used. After the tape measure was produced, the law became a ball of average circumference of not less than 27 inches and not more than 28 inches This rule was extended to encompass all games in 1883. A standard weight followed in 1889: from 12 to 15 ounces. This was amended in 1937 to become 14 to 16 ounces. 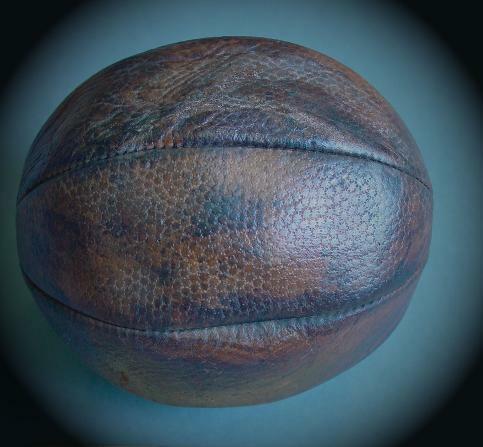 In 1892 the RFU endorsed ovalness, Rugby School's Lindon Big-Side Match ball, as the compulsory shape. The gradual flattening of the ball continued over the years as rules further defined the modern game. In the late 1970's leather-encased balls, which were prone to water-logging, were replaced with balls encased in synthetic waterproof materials. In the life of a sporting pupil at Rugby School. His kit would not be complete without his "Punt-about". To this day.... most boys in schools around the world wait in anticipation for the "Break time" bell to ring. Armed with their tennis ball they congregate on the school playground. Coats & bags down for goals and a game of sorts commencs. Rules change daily. Number in each side differ pending on who turns up, the rubbish kid who's picked last is told "your in goal", but he doesn't mind because he's still in the gang. Half way through the game players swap loyalty and play for their opponent because one side was getting thrashed. The boy who owns the ball decides he's captain, nobody argues. The ball goes onto a roof and Jack-the-Lad shows off his climbing dexterity in exchange for a cheer from his mates and detention if caught. The break-time bell rings again and coats and bags are collected. "Remember who's team your on for lunchtime" as the boys disperse for their next lessons. The, 7-Panel Button Ball, "Punt-about" of yesterday becomes the tennis ball of today. The Original "Punt-about" ButtonBall circa mid-to-late 1850's. Courtesy of Rusty MacLean esq, chief archivist, Rugby School Museum. Rugby. 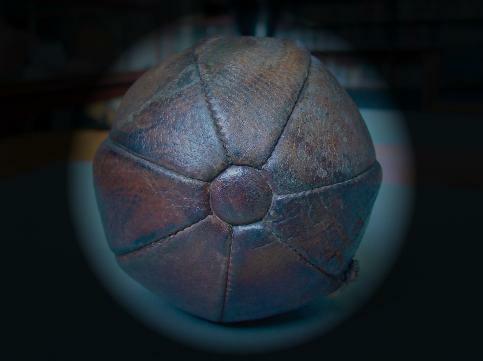 This Punt-about Button ball was discovered in a blocked-up chimney behind the wooden panels of Old Big School, the original schoolroom off "Old Quad" Rugby School. It is the only original known to survive. This Punt-about ButtonBall held the remains of one of Richard Lindons' very first India Rubber inflatable bladders. Within a very short period of time the rubber bladders shape allowed good pressure into the ends of the ball and redefined stitching techniques removed the need for the "button" and was replaced by the 4 panel buttonless ball. Playing football has a long tradition in England and football had probably been played at Rugby School for two hundred years before three boys published the first set of written rules in 1845. The pupils, not the masters, had always determined the rules and they were frequently modified with each new intake. Rules changes, such as the legality of carrying or running with the ball, were often agreed shortly before the commencement of a game. 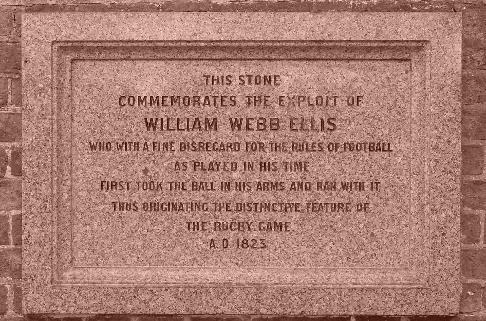 There were thus no formal rules for Rugby Football during the time William Webb Ellis was at the school (1816-1825) and the legendary story of the boy “who with a fine disregard for the rules as played in his time, first took the ball in his arms and ran with it” in 1823 is now legendary. 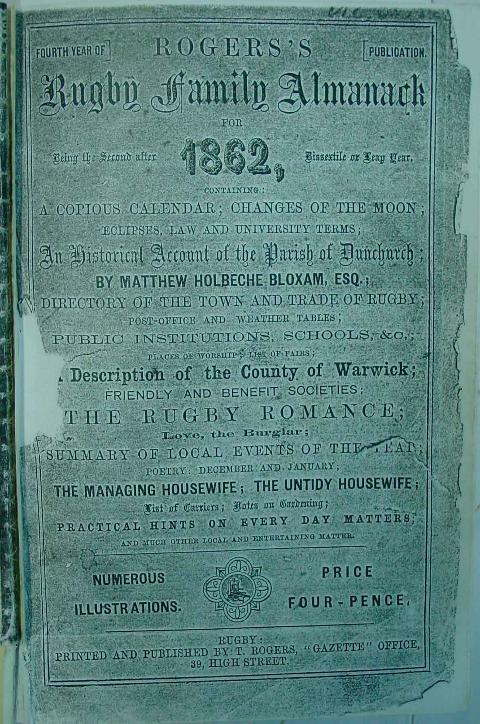 This story first appeared in 1876, some four years after the death of Webb Ellis, and is attributed to a local antiquarian and former Rugbeian Matthew Bloxam. Bloxam was not a contemporary of Webb Ellis and vaguely quoted an unnamed person, possibly Bloxhams brother who was a contemporary of Webb Ellis or Bloxhams father who was a Teacher at Rugby School, as informing him of the incident that had supposedly happened 53 years earlier. The Old Rugbeian Society has dismissed the story as unlikely since an official investigation in 1895. However, the trophy for the Rugby Union World Cup is named “Webb Ellis” in his honour (as is Ellis Park in Johannesburg a major international rugby union stadium), and a plaque at the school commemorates the ‘achievement’. 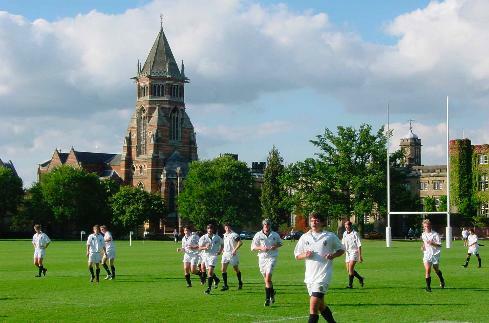 Rugby School has successful claims to the world’s first and oldest “football club”: the Guy’s Hospital Football Club, formed in London in 1843, by old boys from Rugby School. 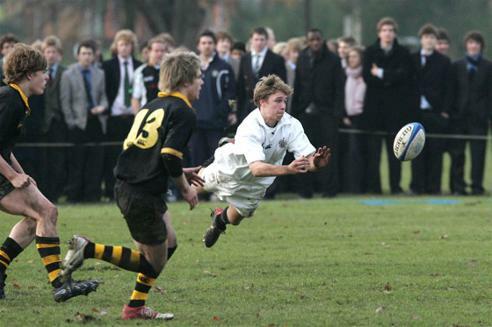 Around Britain and Ireland, a number of other clubs formed to play games based on the Rugby School rules. One of these, Dublin University Football Club, whom Richard Lindon was Pincipal ball supplier, founded in 1854, is the world’s oldest surviving football club. The Blackheath Rugby Club, in London, founded in 1858, is the oldest surviving non-university rugby club. Painted (1852) the year after Hughes John Lindon, son and successor to Richard Lindon, was born. Their is a second print in the series entitles "Cricket at Rugby" the composition is remarkably similar. 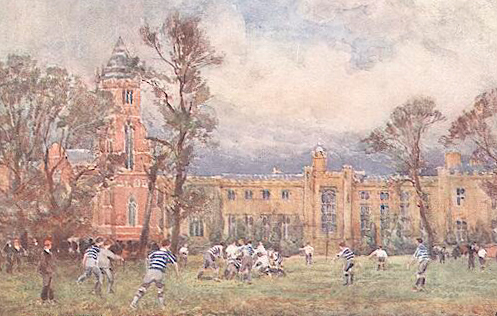 Painted a year after the very first photograph of Rugby being played at Rugby was taken. 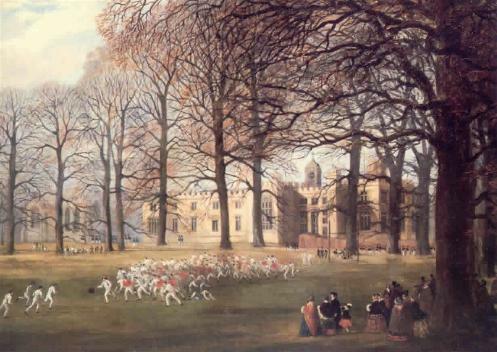 Football at Rugby by E. Harwood (1859) Note the number of Players. Painted from the elevated position of "the mound", one of the early games goals, which is still engulfed in trees to his day. The Fifteen-aside rule arrives as does Butterfields beautiful red brick chapel, not in existence in the earlier paintings. Sam Hawkesley (son of Simon Hawkesley CEO of Richard Lindon & Co.) representing Rugby Schools 1st XV. Rugby School continue to use their traditional "White Shirt". 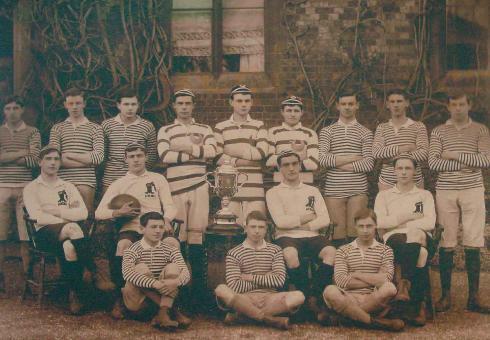 Up until recent times England required permission from Rugby School each time they wished to play in a white shirt.